I love sound of these Essenzza Fuss Free Facials (A$14.95/3pk) that are power-packed with nutrients and antioxidants including: Oat Seed Extract (rich in Vitamins A, B, E, iron, zinc, manganese and calcium), Hydrolysed Collagen (a protein which improves skin firmness and elasticity of the skin) and Hyaluronic Acid (an anti-inflammatory agent which helps to calm redness). Australian brand Essenzza was founded in 2010 and their range of wellness products include facial masks, ear candles (now this is the first I’ve heard!) and detox foot patches. I was recently sent the entire collection of Essenzza Fuss Free Facials to trial, and I’ve been truly impressed with the results! Moisturise + Smooth facial mask with Carrot Seed & Coconut Oil: This mask leaves the skin feeling smooth, supple and moisturised thanks to the goodness of carrot seed and coconut oil. Carrot seed is rich in beta-carotene and helps to prevent skin dehydration and decelerates the ageing process. Coconut oil helps to hydrate and relieve dry skin, leaving it silky soft and smooth. Cleanse + Exfoliate facial mask with Citrus & Pineapple Enzymes: Packed with fruit enzymes, this mask helps to minimize fine lines by breaking down dead skin cells by gentle exfoliation and leave the skin looking smooth and feeling silky soft. Anti-Ageing + Antioxidant facial mask with Moroccan Argan Oil & Vitamin C: Argan Oil is well known for its excellent skin and hair benefits as it provides essential nutrients such as fats and Vitamin E to decelerate the ageing process. Antioxidant, Vitamin C helps to brighten the complexion. 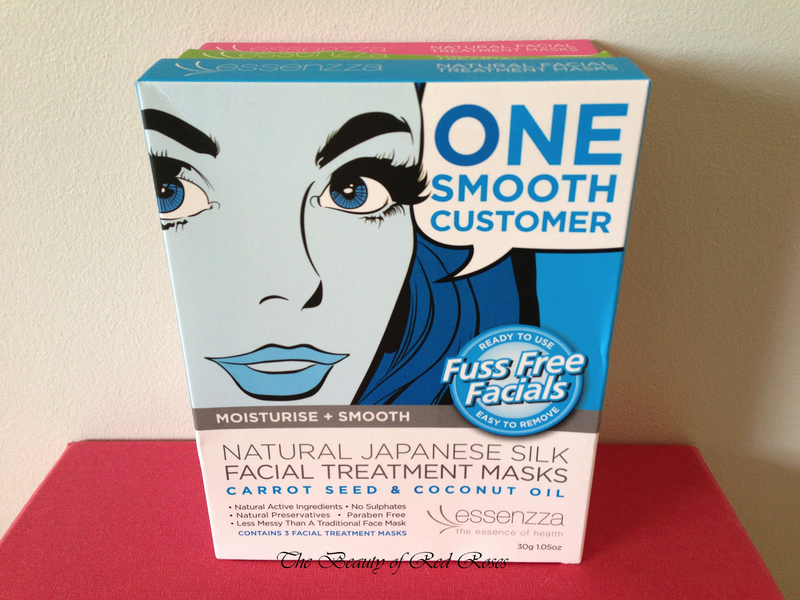 These high-grade natural Japanese silk facial treatment masks are infused with natural active ingredients and are free from harsh ingredients including, sulphates, preservatices and parabens. 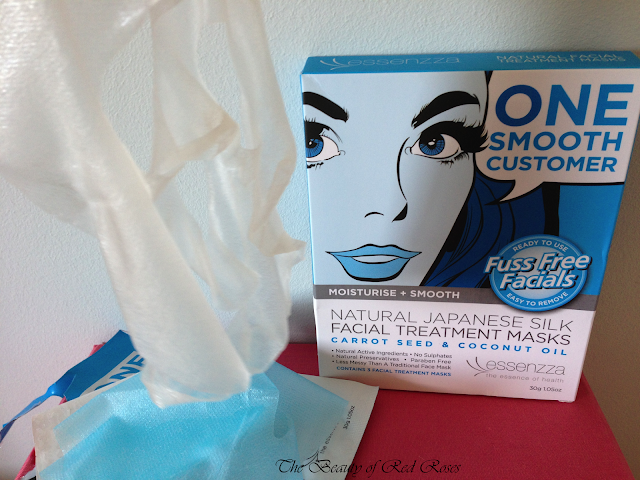 The Japanese silk mask is quite delicate and soft, which is why it comes with 2 protective outer layers, the white and blue layers. Essenzza Fuss Free Facial in Moisturise + Smooth - The three layers of the mask, with the Japanese silk mask in the middle. 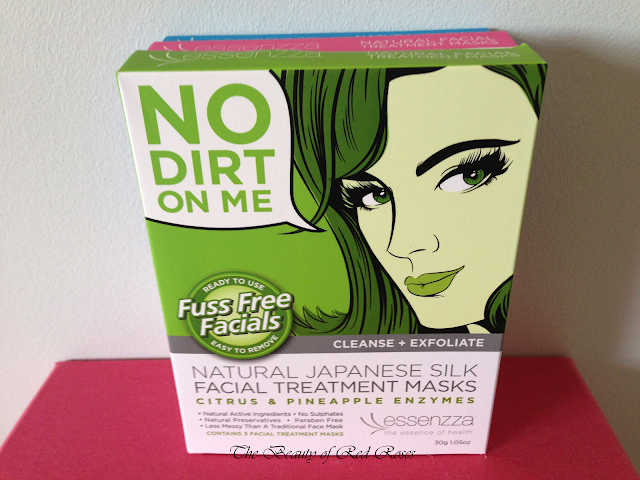 Essenzza Fuss Free Facial masks is recommend for use after cleansing the face. To apply the mask, you need to peel away and discard the white layer to reveal the thin layer of Japanese silk. 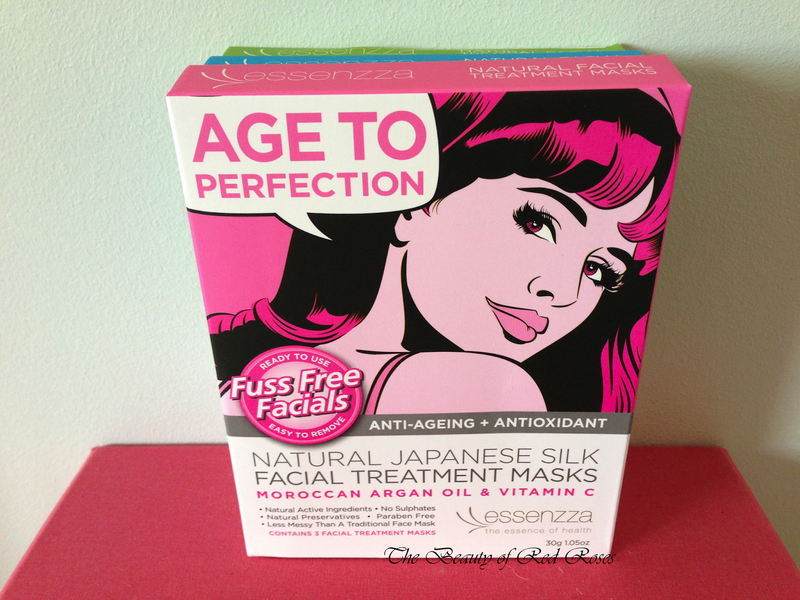 Next, place the exposed side of the mask onto your face, gently press the mask so that it adheres nicely to your skin. Then, carefully, peel away the blue layer and discard. 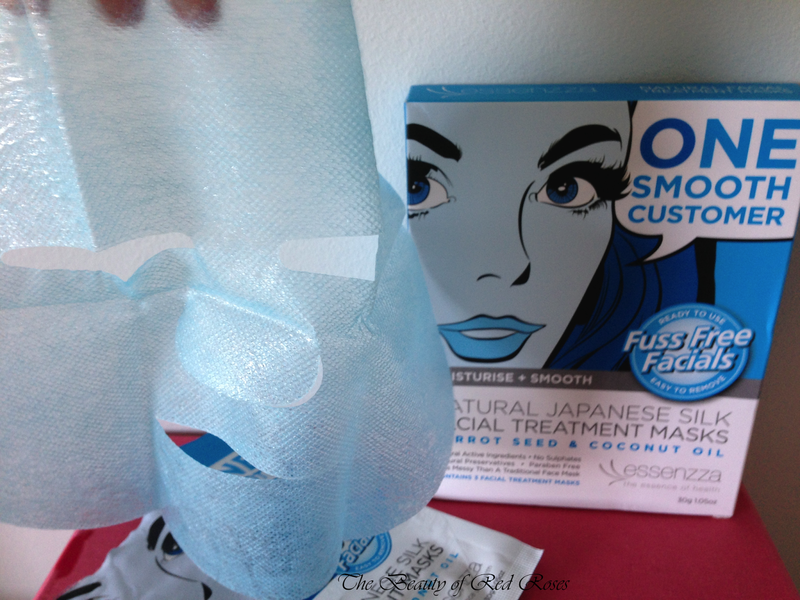 Now that the Japanese silk is in place on your face, just relax for 20-30 minutes for the pampering to begin! Outer white layer with holes. 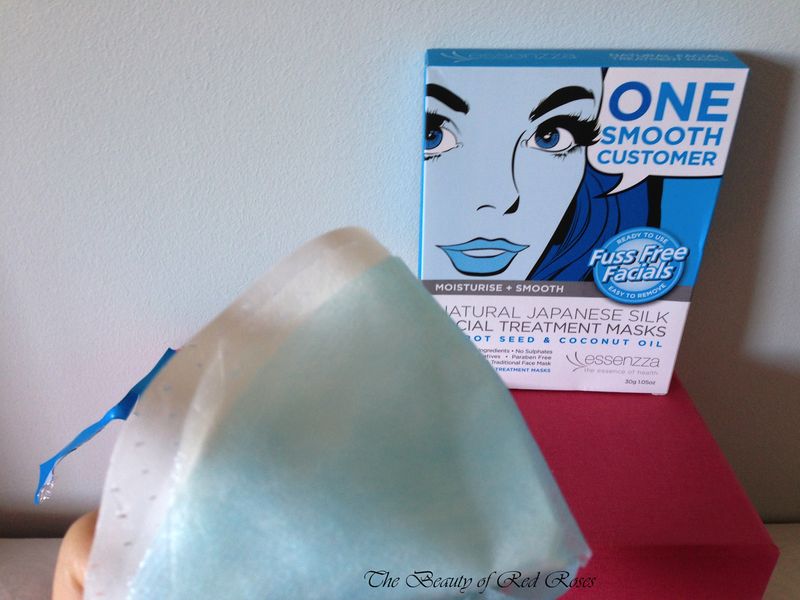 Middle layer - natural Japanese silk mask. The 3 different varieties of these masks perform similarly, however, they obviously provide different skin benefits to address your skin concerns. These Essenzza Fuss Free Facial masks are drenched with effective skin ingredients, so it’s great that these ingredients are well contained within the Japanese silk mask that comes protected by the 2 outer layers. Peeling away the exterior layers of the mask was fuss-free and so easy to apply. The scent-free mask gives a lovely cooling sensation to my skin within the first 10 minutes and after that, my skin felt relaxed and rejuvenated! 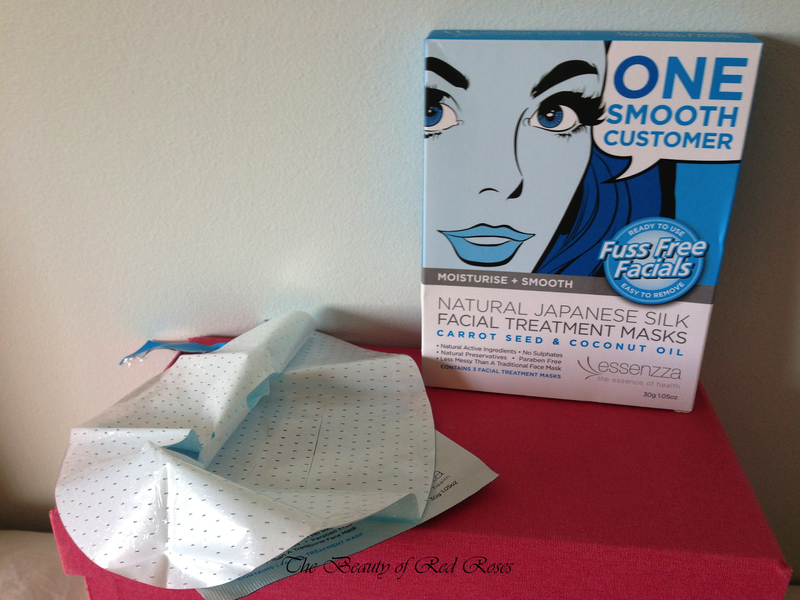 After peeling away the Japanese silk mask, my skin looked and felt exquisite and refreshed! The mask actually left behind a relatively thin layer of moisture, which felt kinda sticky. The residual formula needs to dry completely before applying a moisturiser. It took about 30 minutes for the stickiness to disappear and for my skin to appear matte. Essenzza Fuss Free Facials are available at leading pharmacies and online at www.essenzzahealth.com. 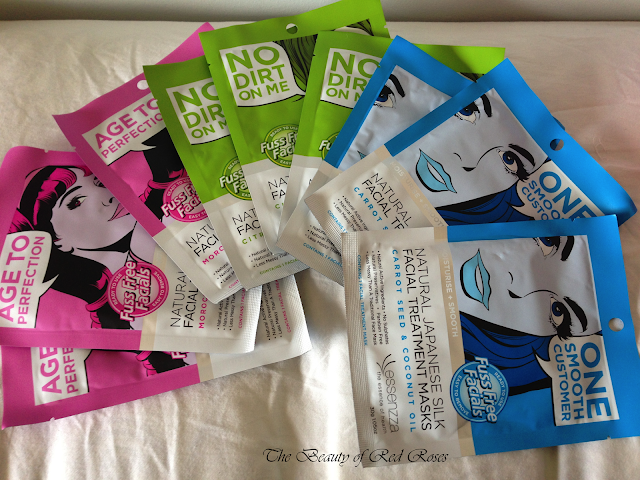 Do you use treatment facial masks in your skin care regime? What are your thoughts on these Essenzza Fuss Free Facials? Products were provided for consideration only. This review is 100% based on my own thoughts and opinions. I am not affiliated with Essenzza and did not receive remuneration to post this product review. These masks sound great, I love the design of the boxes. The masks sound interesting to use as there are so many different layers you need to peel away to use it. The design of the packaging reminds me of comic books!